Dynamic Physical Education for Elementary School Children 18 Edition For classes in Physical Education Instruction Tools and Techniques for the Next Generation of Physical Education Teachers Dynamic Physical Education for Elementary School Children delivers comprehensive techniques on skill development, activity promotion, and physical fitness behaviors, designed to broaden the role and preparation of future and existing physical educators. Physical Education instructors are under pressure to teach more with fewer resources, and this comprehensive text is here to help. The Eighteenth Edition teaches students how to tailor activities to a range of abilities and make classes valuable for all children, regardless of their aptitude for athletics, and adapt games for classroom use if a gym or other open space is not available. 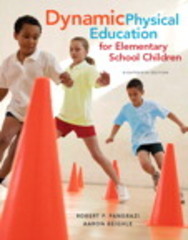 Whether students have previous teaching experience, are currently teaching, or haven’t yet taught in a classroom setting, this text will quickly bring them up to speed on current Physical Education practices to help the next generation live active and healthy lives.